A volcano on the Indonesian island of Bali erupted Monday, belching a plume of ash 2,000 metres (6,500 feet) high as bright orange lava cascaded from its summit. Last week, the tropical island temporarily shuttered the airport and grounded hundreds of flights after Mount Agung erupted. 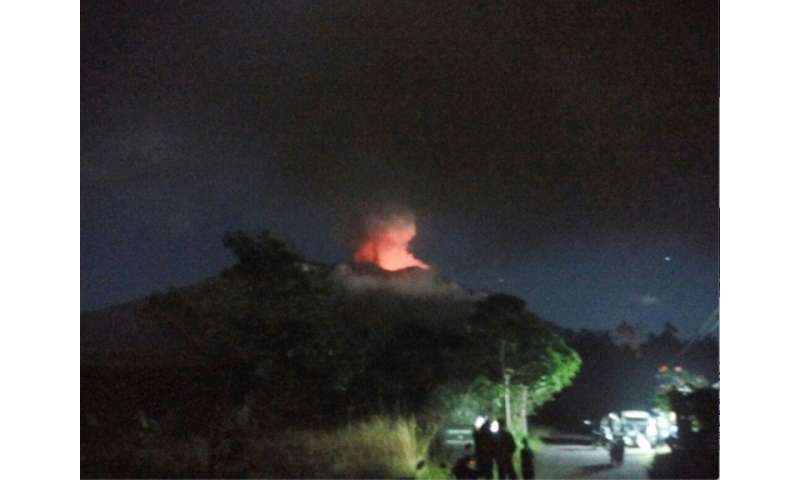 Indonesia's geological agency said the latest eruption of Agung about 9:00 pm local time (1300 GMT) lasted more than seven minutes and incandescent lava descended some two kilometres from its crater. There is a four kilometre no-go zone around Agung. It remained on alert level, the second highest danger warning, while the holiday island's Ngurah Rai airport stayed open. An earlier eruption in November stranded thousands of tourists and pounded Bali's lucrative tourism industry, the backbone of its economy. Ash is dangerous for planes because it makes runways slippery and can be sucked into their engines. Agung, about 70 kilometres from the tourist hub of Kuta, has been erupting periodically since it rumbled back to life last year. Tens of thousands of locals fled to evacuation centres after last year's activity. The last major eruption of Agung in 1963 killed around 1,600 people. Indonesia is situated on the Pacific "Ring of Fire", a vast zone of geological instability where the collision of tectonic plates causes frequent quakes and major volcanic activity.